This entry was posted on July 11, 2017 by Nick. 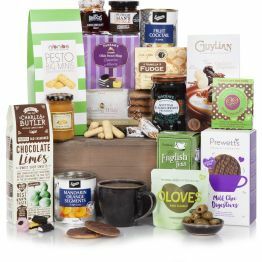 Businesses regularly find gifts from Hamper.com for their staff, clients or suppliers for Christmas or during the year as an appreciation of their work and support. A luxury gift hamper is an excellent way of rewarding hard work or cementing a business relationship. 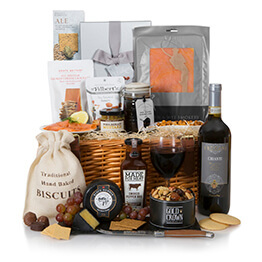 Discover Hamper.com’s range of corporate gift hampers today including corporate Christmas hamper and receive free UK delivery. Hamper.com has an extensive collection of food hampers that are bursting with delicious treats. 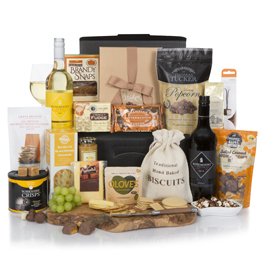 Motivate your staff, thank your clients or reward a retiring colleague with a luxury corporate food hamper. Treat the whole office with this stunning gift hamper. 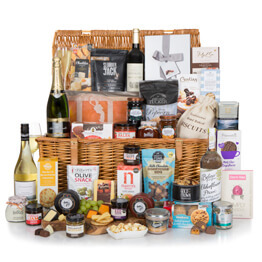 Presented in an elegant open basket, this gift is filled with treats from some of the UK’s best suppliers. Your staff will love Grandma Wilds Chocolate Chip cookies and raspberry truffles from Monty Bojangles. Once the work day is finished your staff can enjoy bottles of Di Maria Prosecco and Finca Amalia Rioja red wine! Perfect at Christmas and throughout the year, they’ll love the Classic Collection Hamper. Your clients or suppliers will love The Sandringham thanks to its assortment of household favourites and unique treats. The Excelcium Cocoa Truffles and Elizabeth Shaw Amaretto Flutes are both sure to be in high demand! Carefully hand packed in an elegant postal box, this gift hamper is a wonderful way of securing future business. 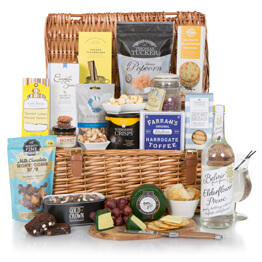 Although many businesses send their clients gifts at Christmas, make sure you’re their favourite with a thoughtful present during the summer like The Sandringham hamper! If you’re really looking to reward your staff or treat a client, then look no further than the Kings Banquet Hamper! This incredible food hamper has something for everyone and will ensure the whole office is happy, no matter how big it is! Smoked salmon, Champagne, chocolates, venison and four bottles of wine are just some of the incredible goodies featured in the Kings Banquet Hamper! Hamper.com offers generous discounts when your business orders in bulk, perfect if you have a lot of staff members or clients to thank! You can collect loyalty points on every order and use them in future purchases to lower the overall costs. 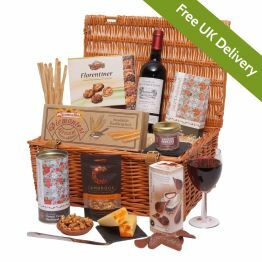 Every gift hamper we provide is available with free next day delivery in the UK. If you’re ordering from overseas, then find out more about our international delivery services.